Femur Harmonica – Hell, Inc.
Femur Harmonica is the name of my new zydeco metal band, we’ll be opening for The Dusty Udders next weekend. In other news, writing really elaborate threats that may or may not even make sense is really fun. We’ve got a new Employee of the Week, which is great because I get sick of doing the same ones over and over. Welcome Ben Hamlin to the company, host of the pirate-themed Pathfinder podcast Cursed. If you’re one of the zillion listeners of the Adventure Zone, give it a listen! If you want to be Employee of the Week, hit up the Hell, Inc. patreon and keep the corporate gold card paid off. Next Week: Taking the intern for a walk. 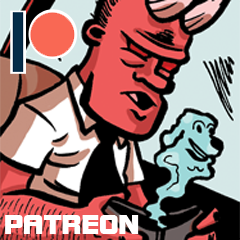 Read it early by supporting Hell, Inc. on Patreon!